Get used to that word, because you’ll be saying it (and other pleasantries) over and over again. 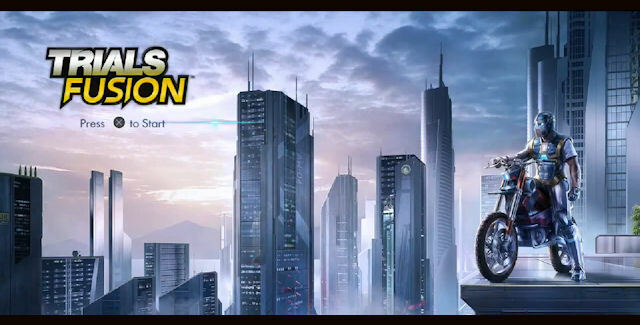 This new entry in the Trials series ups the ante and raises your blood pressure, taking you from desert, to forest, to snow-covered mountain tops and futuristic cities. Trials Fusion is a 2.5D side-scrolling platform racer that walks a fine line between challenging and fun, although it sometimes spills over into challenging a little more often than I’d like. I found myself breezing through the earlier parts of the career mode quite quickly, but some levels throughout proved to be incredibly frustrating, like a boss battle that you’re 3 levels too low to be fighting, even though the game up until that point has been relatively smooth sailing. For those of you that played prior iterations of Trials, you’ll feel right at home, but with a wonderfully added delicious coat of next-gen icing all over everything, that really lets you know that what you’ve got on your plate isn’t just the same old yummy donut you had for breakfast. This is Krispy Kreme Trials. 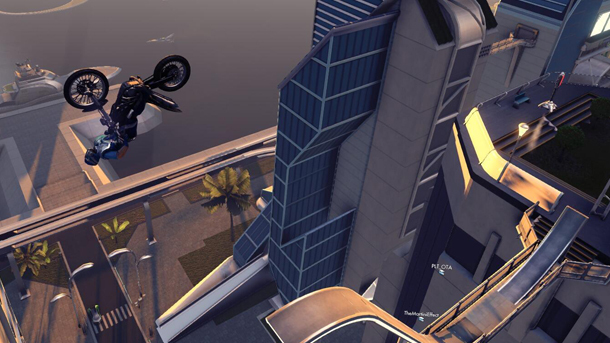 Motocross stunts and unlockables galore, you’ll have more fun this time around than you ever did in the past. So there ya have it. Icing and sprinkles. But how does it taste? Very few games can get me ramped up (see what I did there?…eh?) like Trials Fusion does, and when I do get into it, hours fly by. I glance outside my window and I swear I’ve slipped into a bad Star Trek episode where I’m moving slowly but everything around me is progressing at an alarming rate. But I still don’t care for some reason. Technically, the game controls very well. The different bikes and ATVs control differently and are tuned with different engines or suspensions. As you progress through the career, you unlock these various rides and lots of fancy tricks controlled with the right thumbstick. Some levels force you to use a particular machine, and while I absolutely hate that, I can understand the idea that level design overall can’t translate well to every ride. But hey, it’s 2014 in a free world. I want options. Let me try the ATV on the ice mountain level. Who cares if it won’t work well or at all. I wanna do it and laugh or get frustrated. Stop giving me that weird look. I’m just curious. Go away. Actually, don’t go away. Not just yet. Listen to me talk about the pretty visuals, or icing and what not. Trials Fusion is a good looking game. Not leaps and bounds over the most recent game before this, but enough to remind you that you’re playing it on a 400-dollar, 7-year investment, in 1080p. An update after launch brings performance enhancements and a couple other oddities, but otherwise it’s a rock-solid experience from a gameplay perspective. Regarding network issues, I’m unfortunately having trouble connecting to UPlay servers, but I’m sure that’s either isolated or it will be fixed relatively soon. The audio component is rather pleasing (fitting music, especially at the main menu), and is the first motocross game I’ve played where the vehicle sounds don’t really seem all that annoying. As for the riders themselves and the commentators, I’m very pleased to announce there’s options to turn both off in the sound options. See…someone in the dev house knew people would get annoyed by those two flapping their gums in the same way at the same spots, so they stuck the options in there to shut them the hell up. Thank you. Just like a Krispy Kreme sticking to your insides, Trials will stick with you very well. Tons of longevity to go around. How? Create mode. An absolutely massive track editor dumps you smack into the midst of a huge city with tons of different and editable environments. It’s like a playground for the motocross-loving mind. I’ve had an absolute blast with this, and so will you. Go ahead, create a track that makes your friends mad at you. Do it. You know you wanna. And while you’re at it, give the local multiplayer a go, too. That is, if you like screaming at your friends right next to you. Now that I think about it, who doesn’t like that? Trials Fusion is a good game. Great, even. It’s taken what we’ve all come to know and enjoy, and added in quite a few new longevity ingredients to the mix. Create mode will occupy you potentially forever, and besting your friends on the leaderboards is proving to be a new addiction. Superficial unlocks and strange (possibly isolated) network issues aside, I’d definitely pick this game up if I were you. But why would I wanna be you? I’m me, and I already have the game. Excuse me while I ride.